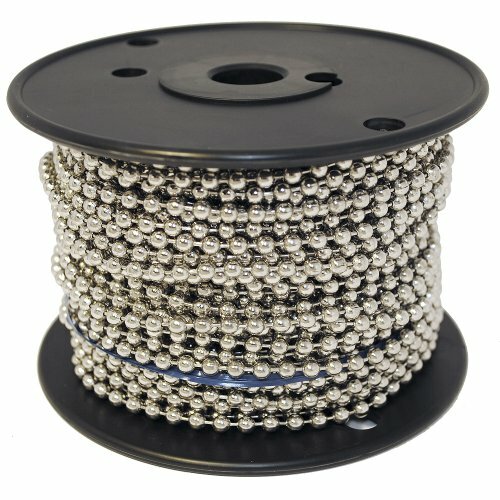 Nickel Plated Steel ball chain, #10 size, bead diameter of 3/16 inch (4.8mm), 100 foot spool. Nickel Plated Steel 'B' Couplings sold separately. This product is genuine Ball Chain direct from the manufacturer - Ball Chain Manufacturing in Mount Vernon, NY - which means that it is made in the USA and is the highest quality in the world. Ball Chain connectors are used to join ends of ball chain together to form loops such as those in neck chains, dog tag chains, key chains, bracelets, and custom chain assemblies. Ball Chain Manufacturing is ISO 9001:2008 certified by the International Organization for Standardization and is also recognized by the Green Business Bureau as a certified "green business". Ball Chain Manufacturing is the largest manufacturer of Ball Chain in the world and the only company that manufactures its chain in the United States. Our chain is everywhere, and our quality is second to none. Don't settle for low quality overseas imitations. Whatever the application, this chain will last.